The Plastic Diaries: How clean is your beach? 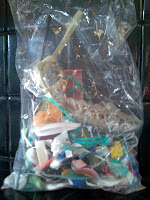 This is the plastic that Bron and I collected during our Sunday afternoon walk on the beach a couple of weeks ago. This pile represents less than an hour of selective picking by the two of us – we left behind the big stuff, the water bottles and crisp packets and the things that I wasn’t prepared to touch without a nice, sanitary pair of (plastic?) gloves. And so this pile represents just the tip of the iceberg. 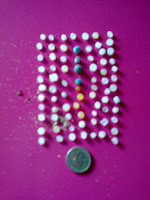 The beach that we collected this from – Fistral in Newquay, Cornwall – is a clean, tidy, well cared for beach. And yet look at what we found. As soon as you start to look a little closer, it’s right there staring at you. I think what surprised me the most were the nurdles. Perhaps more commonly known as mermaid’s tears, these are basically how raw plastic is transported: little plastic pellets that can then be melted down and melted together to make plastic items. 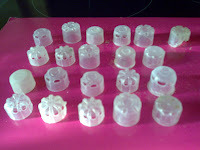 I've included a five pence piece in this picture to give you an idea of their size. They’re tiny, they easily blend in with the sand, and you only notice them once you really start to look hard – and then they’re everywhere. It’s no wonder creatures so often mistake them for food. Aside from the nurdles, the other type of plastic that seemed to show up more than any other were these cover lids from, probably, bottles of water. I've had to put it in our bin, unfortunately - it really is not too nice and I'm sorry, but I don't want it lying around the house forever. I know I'm just adding to the waste pile, but my reasoning is that at least it'll be marginally better there than kicking around on the beach.